San Francisco is the most expensive U.S. city in terms of housing, as well as one of the most expensive to visit. Its famed food scene comes with a price tag. The good news is that while you’re going to pay quite a bit for your average meal, upgrading to a truly memorable meal isn’t as proportional as one might think. Waterbar is one of the nicer Waterfront restaurants on the scenic – but heavily touristed – Embarcadero in San Francisco. This area is littered with dozens of mediocre if not decent restaurants, but a few stand out. Waterbar is one of them. 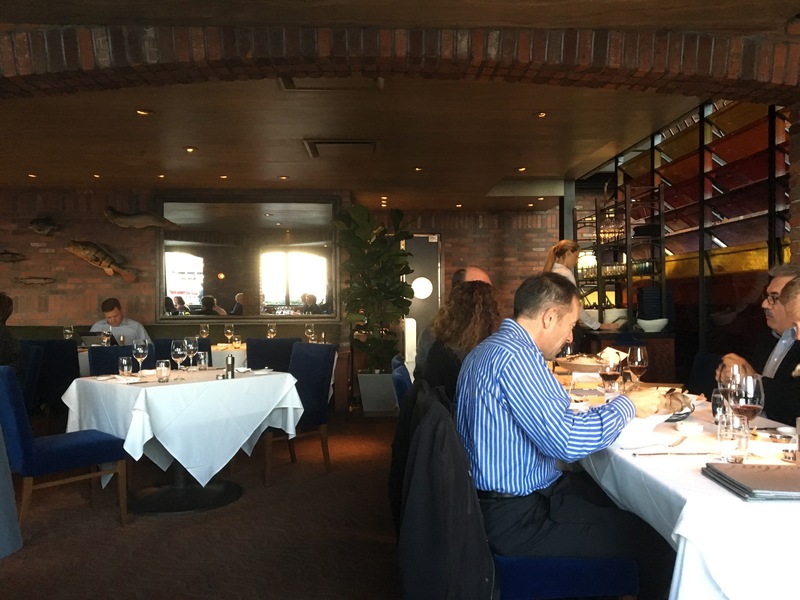 I might have been the youngest diner in the back dining room at Waterbar that night as I dined with my father in a sea of “more experienced” businesspersons (see what I’m doing here? ), but that was fine by me. The meal was fantastic! 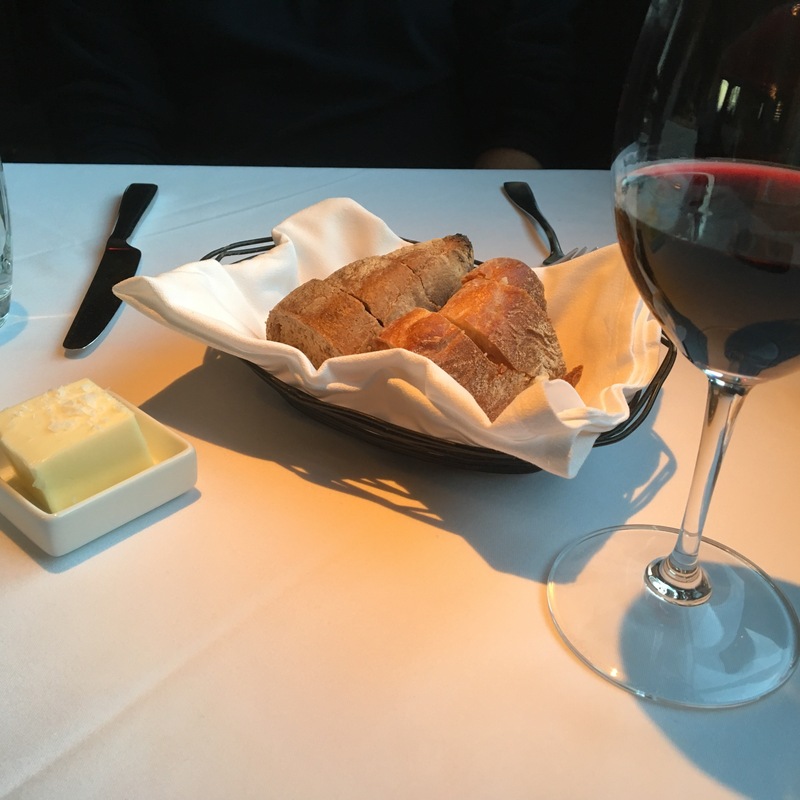 A brief editorial note here: Regular readers may notice that I don’t talk much about myself, and I rarely identify the friends and family members whom I drag on culinary diplomat fact finding tours – AKA going out to eat good food). In this case, I will mention my father, because he has asked to be in this blog to make up for the fact that he does not do social media, so that his friends can see what he’s been up to, and because he financed this particular meal. Thanks, Dad! Back to Waterbar. It’s the sort of atmosphere corporate types take their out of town customers to dinner to impress them. You know the type: Modern architecture and dark decor, white tablecloths. Add large plate glass windows with unobstructed views of the San Francisco Bay, Yerba Buena Island, and Bay Bridge, and a sizeable outdoor dining space, and you have a visual of Waterbar. Its menu changes regularly, and its offerings fit on two pages – with an added insert for its raw bar — which says “We have dignified fare and at least one option to suit every taste” (as opposed to the single page menu, which says, “Our chef is so fantastic that he/she will prepare only four different main courses today because each is a work of art, and something is seriously wrong with you if one doesn’t work”). 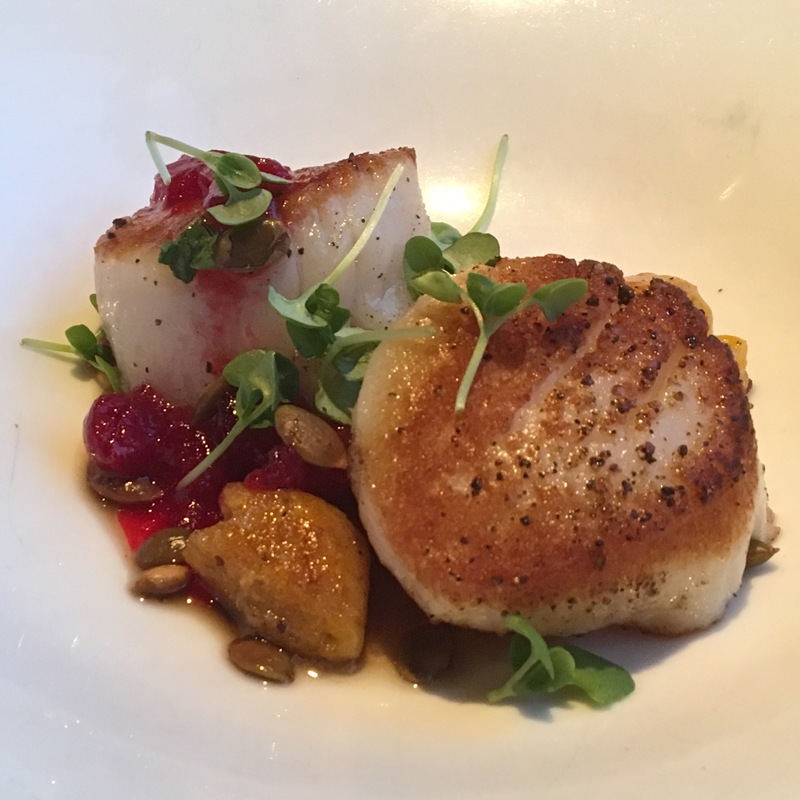 My father and I perused the list of starters and chose to split seared sea scallops, served over sweet potato gnocchi in a brown butter sauce with cranberries and pepitas. Gnocchi and brown butter goes without saying, but cranberries and scallops were a first for me. Why never before? The cranberries’ sweet tartness was an opposing force to the rich, buttery gnocchi and barely seated, tender scallops. It was the perfect start to our meal. A complimentary basket of traditional and whole wheat sourdough bread deserved a B plus rating. A for freshness and warmth; B for texture. (Seriously, why is it so hard to find European quality bread in the US?). The rich butter topped with coarse sea salt made the warm bread definitely worth eating. 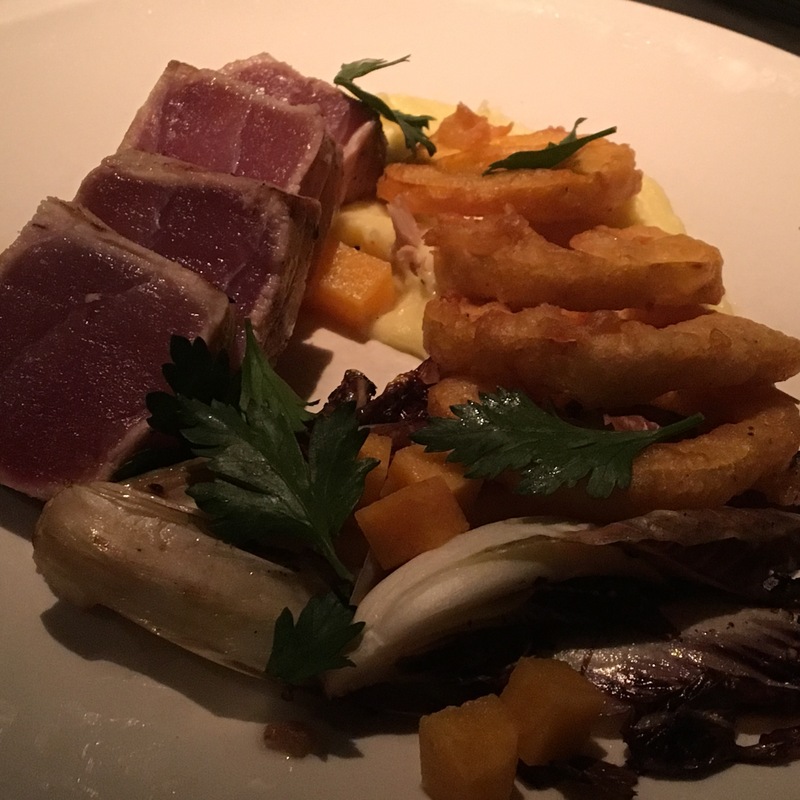 As for the main course, it was a no brainer: Seared Ahi tuna. The menu noted it was accompanied by “crisp sweetbreads.” I may love foie gras, but I draw the line at sweetbreads and refuse to eat them. I assumed the restaurant would not allow substitutions, but I forgot Rule #1 of catering to corporate America – bend over for your customers! Our awesome server, Ytem, happily offered to substitute their beer battered squash when I asked to omit the sweetbreads. That was perfect, because I’d been eyeing the squash as a side dish. The Ahi was the best cut of such steak I’ve had in a very long time. Ahí should represent a quality standard (sushi grade, top quality), but often I find it laced with sinewy bits and an occasional hint that it was frozen, not fresh. Not at Waterbar! It was unbelievably fresh, and its marinade was subtle but perfumed the entire steak. Accompanying garlic mashed potatoes – not something I often eat – was rich and I enjoyed every bite. The squash resembled onion rings, but they offered an earthier, slightly sweet alternative. I’m a fan. Dad chose cast iron porchetta made from “happy pigs raised at Devil’s Gultch Farm.” I don’t know about the rest of you, but as much as I love the concept of “happy meat” and care about sourcing and animal welfare, I don’t want to think too much about the animal before I eat it. Tell me afterwards or just say “responsibly sourced.” If I want more info, I’ll ask. 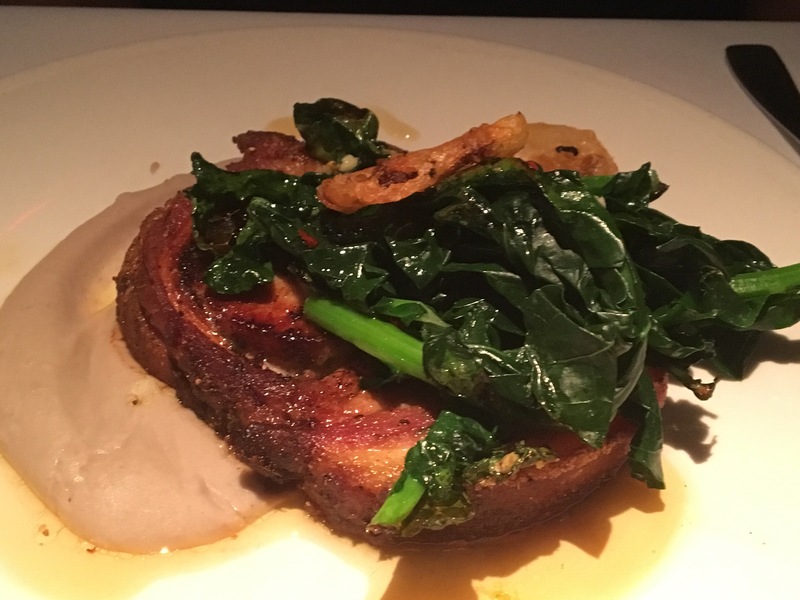 The porchetta was served with very garlicky dark greens (presumably broccoli rabe but more brilliantly green) and preserved lemons. My father couldn’t stop raving about the lemons, so I had to try a bit. The lemon was intensely tart and savory and was fantastic with my fish. I would recommend preserved lemon with the fish. 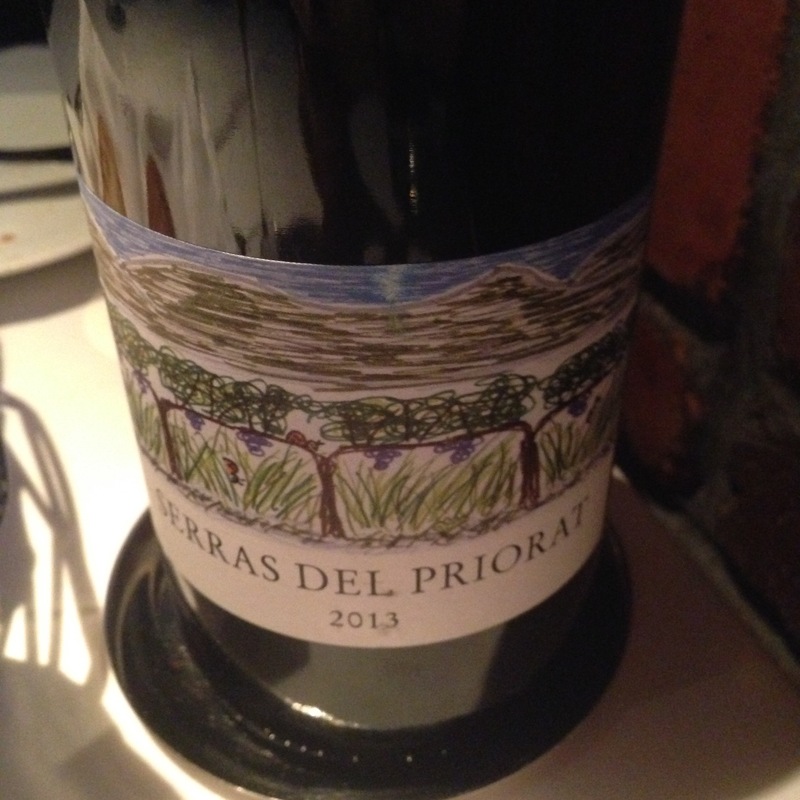 To enhance these dishes, I chose a Garnacha and Carineño (Grenache and Carignan) blend from the rocky, harsh Priorat region of northern Spain. Its tart fruit was light enough for the tuna and pork but flavorful enough to stand alone. It was perfect, save for a couple of fruit flies that made it into each of our glasses. In any other circumstance, I would be disappointed in a restaurant of this caliber for a misstep; however, as a San Francisco resident, I’m painfully aware of the city’s rampant fruit fly population. 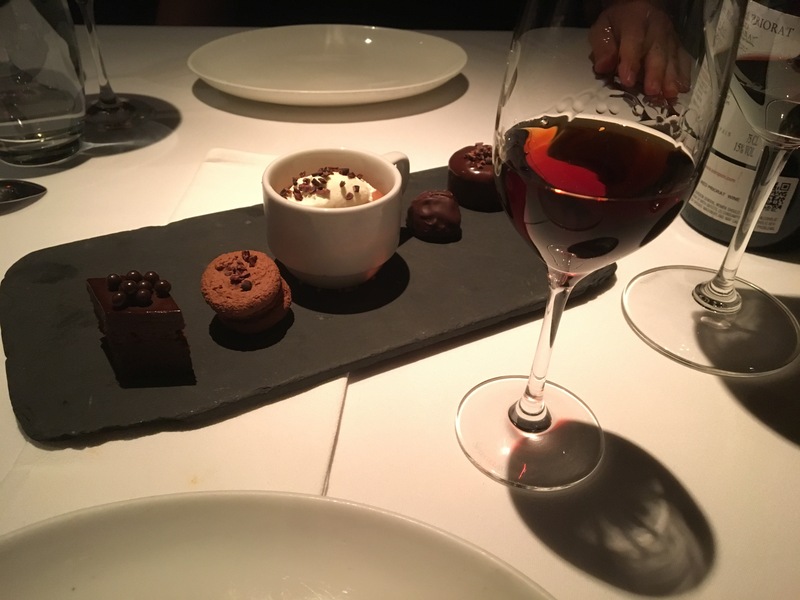 The restaurant’s management, however, was embarrassed for the slight and offered us a replacement glass of wine and a half glass of Graham’s 20 Year Tawny Port wine to accompany our dessert. If you don’t know much about Port, know that it is a blend of vintages (wine from different years), aged in barrels, blended, bottled, and then, if you’re lucky, aged again in the bottle. The ’20 year’ designation means that it was aged in the bottle for 20 years. Which means it is incredibly mellow, with the richest caramel sweetness one could imagine. It would have stood alone, if it hadn’t been for dessert…Dad and I split the chocolate bites selection. Morsels of deep chocolate, each representative of a particular category of dessert, were better than I could have anticipated. 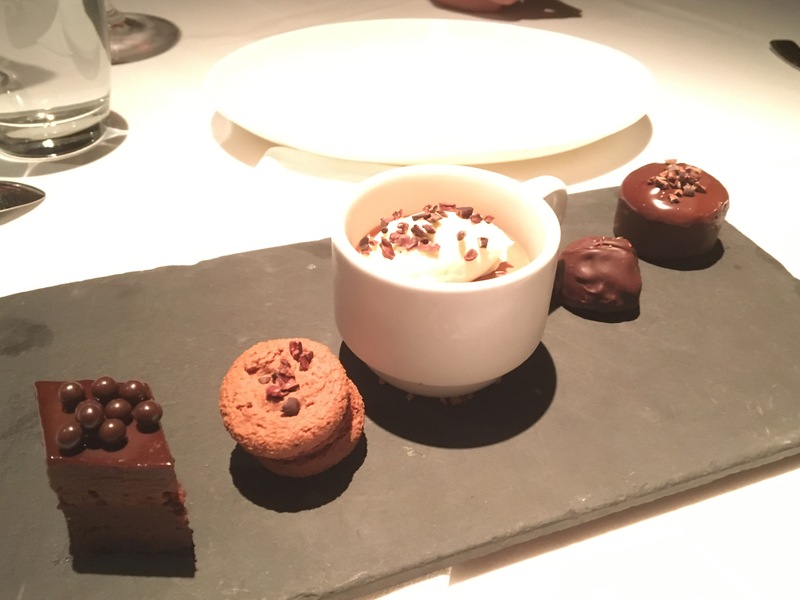 A chocolate-cacao nib macaron, flourless chocolate cake, chocolate pot de creme, a truffle, and ganache-enrobed chocolate cheesecake graced the plate. It was difficult to choose a favorite, but the chocolate cheesecake was insane.